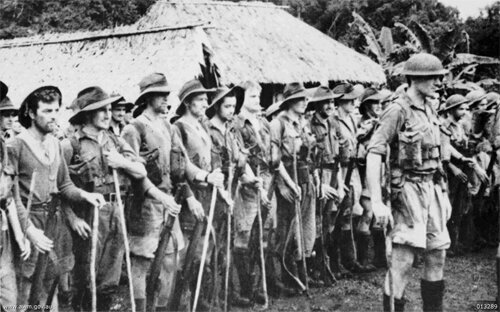 We could really do with some accurate early war CMF forces for use on the Kokoda track, Milne Bay and perhaps the fight for the beachheads. I would love them to look very ragged, a mix of slouch hats and helmets (with and without helmet cover), in shorts, wearing sweaters and shirts, with the correct putees and armed with Brens, Thompsons (no drum mags) and .303's. If I am correct, these could also double for the 21st Brigade on the track and 18th Brigade in Milne Bay, but they should be militia first and foremost. I had my hopes fixed on the SHQ ones, but they are not nearly as nice as I would have hoped and a long way from being accurate. I would be in for an understrenght platoon, so at least 25 figures. In actual action it was helmets..
How many figures? What types? This set like others can be done easily enough with all head gear types. Once initial work is done, head swaps allow for a full set in hat, helmet and any other desired. I would probably take 25+ subject to the variety of poses. Oh, not that old discussion again. Cardinal, I really must disagree with you about the helmets vs hats. I think there is plenty of literary and photographic evidence that hats were used in combat in the Pacific. Probably not as often as helmets and not in big preplanned attacks or defences (though there is that all slouch hat assault on Shaggy Ridge). On patrols, guard duty and what not, slouch hats were certainly worn though. Let's continue this discussion somewhere else though, as Matts offer of helmets AND hats satisfies both our appetites. What types of figures? Let's hear some suggestions. My personal interest (as stated) is skirmishing, so I want a platoon command pack, a pack of patrolling figures, a pack of attacking figures and a pack of crouching/lying figures. Armed with a mixture of Thompsons, Brens and .303's. I can't remember any cases of the militia using Vickers or mortars, but of course no set is complete without them (especially if they are to double as 21st and 18th Brigades). I am no expert on uniforms, so any detailed information on that is welcome. If I am correct they should wear basic tropical uniforms, with shorts. Standard Commonwealth webbing. Some sweaters and sleeveless undershirts for variation would be perfect. Helmets, a few slouch hats and probably even a few bareheads. They should have a very ragged look! Last edited by Real on Mon Dec 22, 2008 12:56 pm, edited 1 time in total. Real actually in the Kokoda and buna and Gona a lot of evidence for helmets, photgraphs are debatable as most are taken of troops not in action..accounts talk about helmets, helmets falling off, helmets being a pest in trees , helmet used as entrenching tools..my research suggest the move to soft hats in action was gradual and it isn't till sadlerberg you star seeing a mix in frontline ares..then as the danger from mortars and artillery dimished so you see more soft hats, but at Kokoda and Buna/Gona I am adamant that helmets are mandatory headgear in action and yes I am sick of talking about and even sicker of being contradicted.. Indeed the aim is to satisfy all likes. i have no interest in getting into it again either..it makes me cross..
that is a very weird picture link..
My 2cents worth though, you will see Aussies in helmets and hats in all areas of the war, so multiple head options is the best way to go. you will have to ask me how to pull my own posts, a wonderous world..any way it is expected of me..can't let the punters down..
poo - i wanted the Dropshorts made first! nice , in 08 pattern ammo puches and even a lewis gun, for the early battles.. Yes, I wanted to ask you about that. It has been said that the militia wore old equipment ('08 webbing and Lewis guns), but I have never seen a picture of them in one, nor heard mention of the Lewis's. Were they used on the Kokoda track? It would be good to now list out how many figures you want in the set, the figure types (riflemen, MG's etc), how many of each type and any equipment specifications for the set. That way people have a clear list of what would be commissioned. I know this would help me to as i need to look at the weapon list in particular to see what i need to have made up. As I remeber the heaviest weapon they had was bren gun , and in the begining a Lewis..